Difficult people and situations are often the biggest stressors for healthcare professionals. There can be added pressure when difficult interactions occur with colleagues because of the need to maintain a long term functional and professional relationship that goes beyond the issue being addressed. All professionals can improve their skills in striking the balance between the extremes of completely surrendering one’s own point of view to avoid all conflict and assertively dominating a difficult interaction in a way that alienates others. Difficult interactions with colleagues will never be totally stress-free, and the workshop examines ‘survival’ techniques to reduce stress and ensure ongoing improvement. how to look past words and emotion to understand people’s real motivations and meaning. 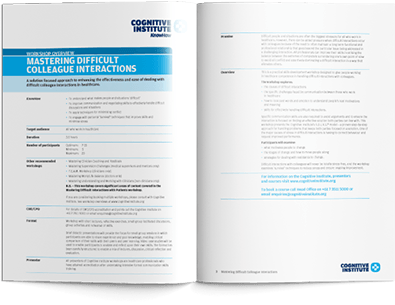 The Difficult Colleague Interactions workshop provides participants with the communication skills required to avoid arguments and ensure the interaction is focused on finding an effective solution both parties can live with. 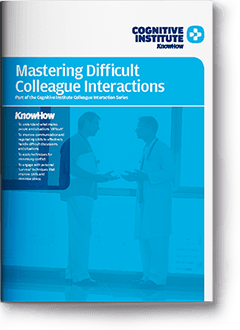 The Mastering Difficult Colleague Interactions workshop is ideal for all healthcare professionals. A solution focused approach to enhancing the effectiveness and ease of dealing with difficult colleague interactions in healthcare.